Discussion in 'Sim Racing Hardware' started by GTPNewsWire, Aug 13, 2018. This article was published by Adam Ismail (@glassjaw) on August 13th, 2018 in the Hardware category. This was a good read, I could relate to this article with money, space, and I still use DS4 but I’ll be considering a wheel come Christmas. If I had the space I would probably get this stand it looks really solid. But might go the wheel stand pro v2 with T150 pro for the money and space. I was considering the t300 rs GT or F1 Ferrari or G29 but their quite pricey. Anyone with the T150 pro able to give your thoughts. Looks like a nice solution, you probably want a chair without castors as you’ll find yourself pulling on the wheel while braking. Also that seating position in the article looked a little too high for me, I like to be looking just over the top of the rim like in a single seater. It’s a little expensive I think but well made by the looks of it. If you’re looking for a seat rather than a stand you can pick up a playseat evo for around £100 second hand but won’t fold away quite as neatly. Would a T150 mount? It doesn't have hard mount points for some reason. Might have to try one of these for my Fanatec. Bit of a nuisance to keep the pedals in place as I have them now, just on the floor. I think it looks great. I would even consider getting one which would be my first purchased wheel stand. The problem is, my ghetto wheel stand is no longer just a wheel stand. I've kind of turned it into a desk now and even bolted a sliding keyboard tray to it last week. I have stuff on it, a mic arm clipped to it, and the wheel itself. It's basically just a couple of cymbal stands from my drumkit and a piece of particle board I drilled holes through but it's been working for me for years. This is why I always buy Tama hardware for my drumkit. Super sturdy and reliable. I always buy Tama hardware for my drumkit. Super sturdy and reliable. DW9000 hardware here. But my Tama Iron Cobra kick and hi hat have definitely served me well in the past 15 years or so. Back when I was in the market for a portable wheel stand, not having a suitable chair to go with a Wheel Stand Pro or Next Level Racing type stand didn’t work for me. I opted for a Playseat Challenge and don’t regret it. Cost me about $220.00. From what I’ve heard I believe they’re hard to come by these days but for me the Challenge is the choice stand for function and portability. Oh and affordability. glassjaw and user3392345 like this. Tried this a long time ago. 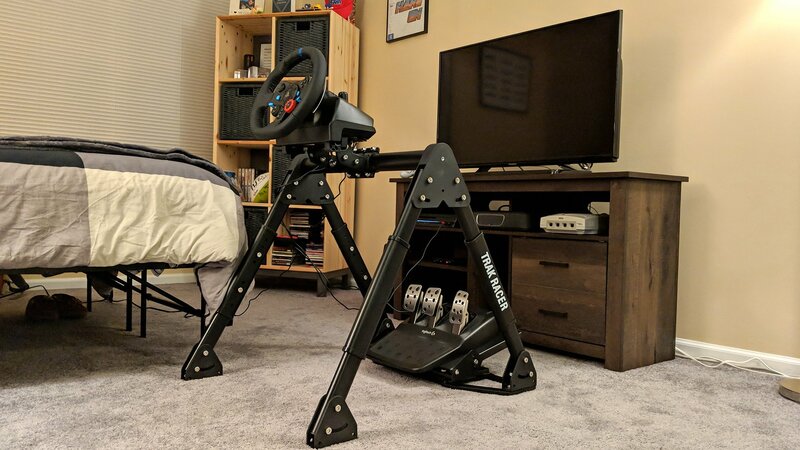 Looks good , but then it has same functionality as "wheel stand or wheel stand pro" which I think cost beetween 120-160€ and this one is retailed 200 $. So by price it is comparable to "Playseat Challenge" which is a stand and a seat combo all in one ( foldable) and I'd say a lot more value for money than this. Take the wheels off that office chair or you’ll role away.